Scher has been a principal in the New York office of the distinguished international design consultancy Pentagram since 1991. She began her career as an art director in the 1970s and early ’80s, when her eclectic approach to typography became highly influential. In the mid-1990s her landmark identity for The Public Theather fused high and low into a wholly new symbology for cultural institutions, and her recent architectural collaborations have re-imagined the urban landscape as a dynamic environment of dimensional graphic design. Her graphic identities for Citibank and Tiffany & Co. have become case studies for the contemporary regeneration of classic American brands. Scher has developed identities, packaging for a broad range of clients that includes, among others, The New York Times Magazine, Perry Ellis, Bloomberg, Target, Jazz at Lincoln Centre, the Detroit Symphony Orchestra, the New Jersey Performing Arts Centre, the New 42nd Street, the New York Botanical Garden, and The Daily Show With Jon Stewart. In 1996 Scher’s widely imitated identity for the Public Theather won the coveted Beacon Award for integrated corporate design strategy. She serves on the board of The Public Theather, and is a frequent design contributor to The New York Times, GQ and other publications. 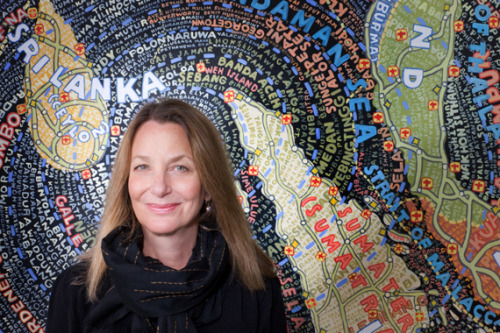 In 1998 Scher was named to the Art Directors Club Hall of Fame, and in 2000 she received the prestigious Chrysler Award for Innovation in Design. She has served on the national board of AIGA and was president of its New York chapter from 1998 to 2000. In 2001 she received the profession’s highest honour, the AIGA Medal, in recognition of her distinguished achievements and contributions to the field. She is a member of the Alliance Graphique Internationale. Her work is represented in the permanent collections of the Museum of Modern Art and the Cooper-Hewitt National Design Museum, New York; the Library of Congress, Washington, D.C.; the Museum für Gestaltung Zürich; the Denver Art Museum; and the Bibliothèque Nationale de France and the Centre Georges Pompidou, Paris.